This book sounds INCREDIBLE. I love how much of an impact Sorcha had on you. The fact that she doesn't even mutter a word throughout her ordeal and yet such breathtaking romance and characterisation is developed is... well, true talent. I would not have paid much attention to this based solely on the cover, unfortunately, but thank YOU for making me want to read this!! Beautiful review! I've been meaning to read some of the author's books, esp this one so I'm so happy to hear such high praises from you! I want a book to make me speechless too! Wow, Keertana! Yet another stunningly written review from you! Sorcha sounds like such an unbelievably amazing character, I can't help but love a girl that's able to save herself, no dashing hero needed. On top of that we get a slow burn romance? MUST READ THIS NOW! I have had this author on my wish list for a long time and your review is a good swift kick in the rear to check her out. I do have her lastest book for review and of course I am so behind. I will read her I will! I love a slow burning romance so I am excited about that aspect. That aside, I agree with basically everything you've said in your review. 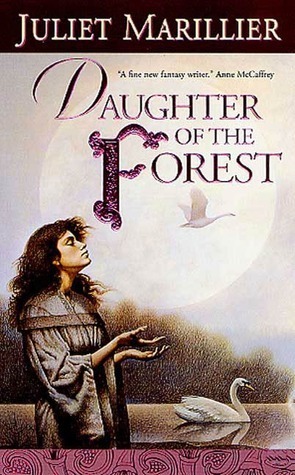 It's been years since I've last read Daughter of the Forest, but it's one of the best fairy tale retellings I've ever read; one of the best adult fantasy books in general that I've ever read, actually. I love that so many people are reviewing it and bringing it to the attention of others who may have otherwise passed it by. I definitely need to do a reread in the near future! Wonderful review! Oh man! That review has me hitting the buy button... It sounds incredible and I'm SO with you on the slow burn romance. The kind with those few very special moments that mean so much without really even happening. I might have read this as a teen cause it seems familiar. Other than the cover which is of course very familiar. If I did read it I don't re all the story at all. Keertana, I haven't read any of Marillier's novels other than Shadowfell but I've heard her adult novels are a must read for fantasy fans. I definitely plan on checking this one out as I love that it features a realistic heroine who isn't waiting around for some hot guy to show up and rescue her. Oh, and the way you described the romance completely sold me! I love this book, so I'm happy you did too! This really is such an amazing book. I just love that scene at the beach :) And all the rest of the books in the series are really good too. I've actually been meaning to reread them all. Beautiful review! Oh I loved this book so much! I read it earlier in the year with Lauren after recommendation from Heidi and Alyssa. I'm a very different reader than Lauren but I found that I loved it much the same as she did, and that seems to be much the same as you. So fantastic and incredible! Where we differ is that when I read a book like that - so amazing and epic and just, delicious, for lack of a better word - I have to soak in it for such a long time and think about it and I'm not ready to give it up yet. Even though it has been a couple of months, I'm still not ready to read the second book, especially since I've heard that it might be better than Daughter of the Forest. I'm don't want to give that incredible space up yet and make room for another story to fill it. That probably doesn't make any sense at all. I'm so glad you loved this one and I love your thoughts on it. Great, brilliant review. I feel like your paragraph on the romance was written specifically for me, because that's EXACTLY the sort of thing I like. This sounds completely incredible - I need to meet this Sorcha soon it seems! Wonderful, wonderful review, Keertana! This sounds really great so I think I may need to try and locate a copy of this book. Nice review! I recall trying to read this almost exactly one year ago, but I put it down after 50 pages because I was studying for a major exam. For whatever reason, I never decided to pick it up again, and there it is on my bookshelf at this moment collecting piles of dust and yearning to be read. Your review, however, convinced me that I absolutely MUST get back to it! After all, I loved Heart's Blood very much. Woh! This really does sound amazing! I've been told I need to read Juliet's books and you have just convinced me. Sorcha sounds like a brilliant main character and I'm impressed by how much this book got to you! *sigh* Keertana, your reviews are always both food for thought and food for soul. I just love it when you get so inspired by a book. I've been meaning to read this since... forever, I guess, and I think this beauty of a review was just the push I needed. Thank you. Did you know that you can shorten your links with Shortest and make dollars from every click on your shortened links.